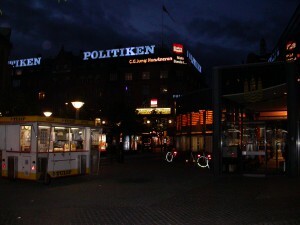 “Painting: The art of protecting flat surfaces from the weather and exposing them to the critic” Light show on Copenhagen town square and in the main hall of “Politiken” May 2004. Quotes on art and painting by Ambrose Bierce, C.G. Jung, Guy Debord og Sigmund Freud et. al.